Mohammad Mehrmohammadi is an assistant professor of Biomedical/Electrical and Computer Engineering at Wayne State University. He received his B.Sc. degree in Electrical Engineering from Sharif University of Technology (Tehran, Iran), the M.Sc. in Electrical and Computer Engineering from Illinois Institute of Technology (Chicago, IL), and the Ph.D. in Biomedical Engineering from the University of Texas at Austin (Austin, TX). His doctoral research at Ultrasound Imaging and Therapeutics Laboratory at UT Austin was focused on design and development of novel ultrasound-based molecular imaging. Prior to joining WSU, Mohammad worked at Mayo Clinic College of Medicine (Rochester, Minnesota) as a Senior Research Fellow where his research was mostly focused on development and clinical evaluation of various ultrasound-based tissue elastography methods for applications such as bladder poor compliance diagnosis, and thyroid and breast cancer. Mohammad is the recipient a number of awards such as DOD breakthrough award (Breast Cancer Program - 2017), College of Engineering excellence in teaching award (2017), and Karmanos Cancer Institute pilot research grant (2017). 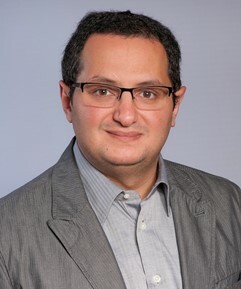 Mohammad is a member of editorial board for a number of a number of journals including Ultrasound in Medicine and Biology and Medical Physics and serves a technical committee member for Acoustical Society of America (ASA) and SPIE Medical Imaging conferences. He is a member of institute of Electrical and Electronics Engineers (IEEE, UFFC and EMBS society), International Society for Optical Engineering (SPIE), World Molecular Imaging Society (WMIS), American Association for Cancer Research (AACR) and Sigma Xi. Post-doctoral fellow and Graduate Research assistant positions are available in Dr. Mehrmohammadi's Lab. Applicants who majored in Electrical Engineering, Biomedical Engineering, Applied Physics, or a related engineering field with string background in electronics, signal processing, acoustic and optics are encouraged apply. Applicants should email their curriculum vitae to Dr. Mehrmohammadi at mehr@wayne.edu.